Surface longline, aimed to catch shark and large pelagic species. The main monofilament line is normally 2.5 - 3.5mm twisted line of PE / PP mixture, and the distance between the hook lines may be 15 to 30 meter (50-100ft) A 30 meter long liner with 100 ton freezer and 40 days autonomy would operate a 100 kilometer (60 miles) line with 5,000 hooks. Surface longlining can also be performed by smaller boats from 20ft. on day fishing, operating 100 to 1,000 hooks. 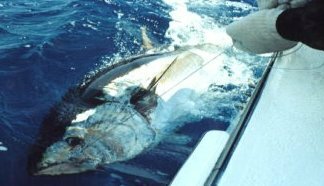 The bait is usually whole pelagic fish with firm flesh such as mackerels.